The Legend of Zelda: The Ocarina of Time turned 20 years old today. 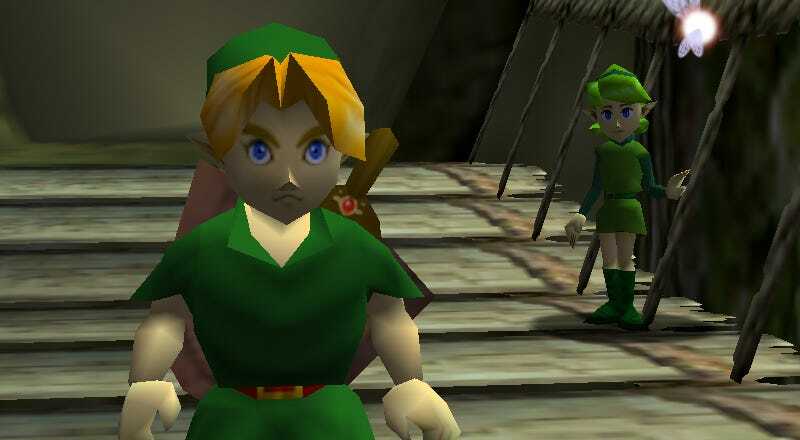 Link’s first 3-D adventure, for the content-starved Nintendo 64, captivated a whole new generation of players, setting a standard for adventure games and laying a foundation for today’s massive open world journeys. In spite of this, Ocarina of Time remains a unique experience even two decades later. Much of that is owed to how simple it was. After Nintendo shifted Super Mario into 3D at the launch of the Nintendo 64 in 1996, one major thing was on players’ minds: How awesome will Zelda be in 3D? Answer: Mind-blowing. Ocarina of Time was released on November 21, 1998 in Japan, and available a few days later (just in time for a Thanksgiving weekend marathon) in the U.S., needs to be discussed in the context of its release. That release was defined by eager fans and a major step forward in graphics. There have been countless open world games since 1998, but Ocarina of Time was the moment when the concept of massive, interconnected worlds began to really crystalize. It wasn’t a new concept—the Ultima series has been providing its own version of mass-scaled fantasy for years—but Ocarina of Time mixed scale with a graphical fidelity that hadn’t been seen before. The result was a version of Hyrule that, while minuscule by today’s standards, felt like a real place and not merely a connected series of video game levels. Its scale was shocking but not without purpose. Hyrule Field is largely a barren plain that takes minutes to walk across, but moving from the cheerful Kokiri Forest and into the wide-open frontier imparted a sense of adventure. It was a quiet sort of wandering, an exciting but isolated hike that grants downtime before the explosion of activity encountered in Hyrule Castle Town. Twenty years later, that’s a lesson that some games still fail to take in. Ocarina of Time pushed the boundaries of scale but never at the expense of tone. There’s no need for random events or radiant quests. The world is enough. That simplicity is Ocarina of Time’s biggest strength. It can be tempting to look back and think of Ocarina of Time in terms of gameplay innovations. This is the game that created Z-Targeting and helped pioneer in-depth spatial design with its dungeons. But Ocarina of Time’s enduring legacy is as much a lesson in restraint as it is in innovation. This is a game of implication, where the world spins just enough to sell us on the fantasy. It is not densely populated or particularly reactive in the moment. Outside of a few key quest chains and bombable walls, Hyrule is largely indifferent to the player. Link might be the Hero of Time and the only person who can save the world from Ganon, but Hyrule itself—Death Mountain, the Gerudo Desert, and more—would remain even if we failed. And it’s telling that while the series would later experiment with gameplay gimmicks like transforming into a wolf or sailing through the skies on a giant bird, Breath of the Wild would embrace this sentiment and leverage it into a powerful and equally standard-setting open world. Like Ocarina of Time, it is not afraid of silence and the world carries on, even without its hero. Ocarina of Time isn’t the most narratively daring or thematically compelling game in the Zelda series. The Wind Waker makes more effort at giving its characters (including Ganon) depth, while Majora’s Mask experimented with mood and tone to greater effect. But Ocarina of Time endures because it sets a standard for game worlds. Hyrule pushed the boundaries of scale, but never bent backwards to accommodate the player. Many games seek to emulate the scale and scope of Ocarina of Time but omit the simplicity. It’s that simplicity, that willingness to offer empty spaces and quiet hikes in equal combination with tricky boss battles or trading sequences, that helps Ocarina of Time resonate to this day. You Have $4 Million, Do You Buy A Bugatti Veyron SS Or MiG-29UB?